UNCOMFORTABLE MOMENTS: Veiled Threat: Part One. I became engaged in February, and when the news was announced, my sister was among the first to step up with a token. "Here," she said with a snicker, and pushed across her kitchen counter a two-inch copy of The Knot magazine. 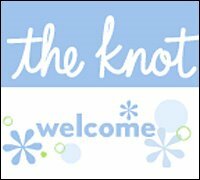 Having previously spent my energy on deflecting solid relationships and honing an arsenal of solitary rituals, I was as suprised as anyone to find myself in the target demographic of The Knot or any other bridal publication. But here I was, reading it with a mixture of fear, excitement and mostly confusion. My wedding experience up to now amounts to one underwhelming performance as a bridesmaid and a handful of attendances as a thoroughly uninvolved guest. Generally, my interest in wedding details can be summed up as "Where is the bar," "Did I miss eating anything" and "How can I get out of this conversation." "Well, do you want to walk down the aisle?" Mike said. "What do you mean?" I said. "Do you want a ceremony where you enter alone and walk down the aisle? Not everyone has an aisle," he informed me. "Of course I want an aisle," I said. "See? You have some ideas about what you want for your wedding," he said. And the sheer mind-blowing dimensions of decision-making chain I was about to encounter became that much clearer. One of the weirdest parts of the magazine my sister gave me is the bridal gowns section, which takes up a considerable amount of the issue. One of the first things that struck me about bridal fashion is that unlike in other types of fashion, the models are not threatening. In many cases, they look positively suicidal and leave me hoping that whatever happens, I will not end up looking like the person pictured in the dress and have some hope of doing better for myself. The other bizarre aspect of bridal fashion photography is the way models are often set up to appear in scenarios that, if they are lucky, most real-life brides will never find themselves in. I liked this one so much that I gave it my own caption. That "suicidal" pic looks like a still from a zombie movie -- "Pissed-Off Zombie Brides"
OK -- so planning making you uncomfortable now? Wait 'till you have to deal with reception seating arrangements -- word of advice: NO ASSIGNED SEATS. Another word of advice -- don't take wedding planning advice from divorced friends. I agree about no assigned seats. Why don't people do that more often? Yet even unassigned seats are not without peril. At one wedding last summer, the groom's mother wanted us to move from the table we had already staked out (ie, coats and bags on seats, us standing next to the table drinking). My mom-in-law snikted out the claws and fought her off. It was strange because the placement of the table wasn't special or anything. You're doomed, Ctina. Doomed! Your best bet is just to do whatever you want and if anybody gets pissed, tell them to go to hell. If you adopt that attitude NOW, you will be rewarded. Yeah, I think that's what I don't like about the whole table thing -- you're left to the fallible instincts of someone else as to whom you'd have fun with. But then I guess if you're at a wedding where you don't know anyone, it's like you're the unpopular kid looking for a seat at the high school cafeteria. My hubby is half right about the attitude to adopt. You can always thinkg "go to hell - it's my wedding!" but you don't always have to say it. Some people may want to pick a fight, but you can stop it if you just don't care. The vows are very important, and you probably want to have a really fun party, but everything else just doesn't matter. It's only a few hours anyway. The marriage bit is the really lovely part. The Snacking and the Damage Done.